I'm pretty sure that it's all but a physical impossibility for a sports-related anime series to go an entire run without a single training camp episode - There's probably a law against it or something. So it goes that episode ten of Taishou Yakyuu Musume takes us on... guess what? A training camp! Despite the promise of first-class food and accomodation alongside the equally ubiquitous hot springs, a recent rainstorm puts paid to the first two aspects of the camp, with the property Akiko was hoping to use unserviceable, and leaving the girls instead to sleep in an assembly hall for their two week stay. Mind you, this isn't really the primary concern of Kyouko, who spends all of her time worrying about how to get closer to Tomoe instead. Thus begins an episode filled to the brim with gentle yet genuinely entertaining humour, as all of Kyouko's plans go awry for various reasons, culminating in a test of courage that ends in disaster but does at least show Kyouko a way forward to at least progress and succeed when it comes to baseball. Oh, that's right, baseball, I almost forgot... There was some of that here too. 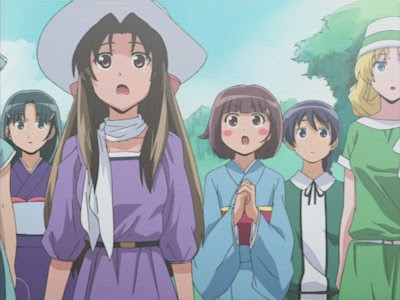 Anyhow, despite using up its allocation of anime tropes for at least a month, Taishou Yakyuu Musume continues to be a great fun series to watch, with its bright and breezy characters proving to be entertaining throughout while the period setting of the show adds an extra element to both the visuals and the story itself. Ground-breaking certainly isn't a word that could be levelled at this series, but who cares when it never fails to leave a smile on your face?